03/07/2019: Congrats to Caity on publishing her article “Winter grazing does not affect soybean yield despite lower soil water content in a subtropical crop-livestock system.” in Agronomy for Sustainable Development. Well done. 03/07/2019: We are thrilled to have Sequoia transition from a Junior Specialist to MSc student in the lab starting September. Sequoia will be taking the lead in investigating whether grazing cover crops add benefits to soil ecosystems and system productivity at Russell Ranch. 03/07/2019: Congrats to Vanessa and Jen on publishing their article “A New Method to Correct for Habitat Filtering in Microbial Correlation Networks. ” in Frontiers in Microbiology! 03/06/2019: CalCAN climate summit was a success. Thanks you to Caity and Valerie Eviner for helping conceptualizing our session and putting together a though provoking talk around opportunities and challenges of managing for resilience in both intensive and more extensively managed systems. Always good to meet and get feedback from colleagues and stakeholders! 02/13/2019: Cover crops are growing, sheep are grazing, students are sampling and lab is buzzing — what a great time. 02/12/2019: I shared our results on soil health as a building block of resilience as part of the NRCS webinar series. You can watch it here. Thanks to the ~372 participants for their great questions and engagement! 02/05/2019: Thank you to Angela Kent at University of Illinois Urbana Champaign for her invitation to give a cross department seminar on Rhizosphere Ecology and Agricultural Sustainability. Insightful feedback, stimulating discussions and new connections for future research always make it worth flying across the country. The high carbon footprint of flying has made me reluctant to travel far for 20-50 minutes talks, especially since we now have new ways of connecting! 02/01/2019: Leah is now off to Tanzania for 6 months as part of her IAD double major to test drought resilience of intercrops schemes in maize in collaboration with Todd Rosenstock and others at ICRAF. Exciting to see Leah taking so much leadership in empirically testing the “climate-smartiness” of these practices (is that a word?). 01/29/2019: Kick off of our soil health in Almond project. We are prospecting for growers orchards and having very interesting discussions with practitioners around the perceived benefits and research needs. More info here! 01/18/2019: Had a great visit with NRCS staff and Xerces at the Lockfort Plant Material Center. An impressive amount of plant species are being evaluated as summer cover crops. Lots’ of potential, I hope we’ll be able to conduct some research there soon. 01/10/2019: Well, the annual SSSA meeting was a success. Three posters presented by the team and one talk in a dream session around soils as drivers of multifunctionality organized by Tim Bowles and his colleagues. Lots to process. Looking forward to a reunited Tri society meeting next year. 01/03/2019: We welcome Pedro AA Nunes, PhD visiting Scholar for Brazil working on ICLS with Paulo Carvalho at UFRGS. Pedro will be working in close collaboration with Emilio Laca to explore resilience and stability outcomes of re-integrating beef/pasture phase in corn-soybean systems in Brazil. 01/02/2019: After some well deserved vacations, we are now starting this new year full of energy, with exciting new collaborations and discoveries. Looking forward to working with you all and thank you team for your hard work! Lot’s of accomplishments to be proud of. 12/04/2018: Another successful Almond Board conference this year – Lot’s of interest in cover crop and soil health. Thank you to the students from all labs for developing such great outreach material and activities. 11/23/2018: Travelled to France to visit Agrocampus Ouest in Rennes to develop new collaborations around ecosystem services assessments in diversified systems across scales and rhizosphere ecology. My goals was also to champion a new MOU between our two institutions to promote student and faculty mobility and teach a small module in their new master program in Agroecology. Needless to say, it is also always good to be home! 11/13/2018: Glad to share here a wonderful video sponsored by Fibershed explaining a bit more about our collective work on integrated sheep vineyard systems in California. 11/10/2018: Presented our work on integrated sheep vineyard systems at the Wool Symposium (Fibershed) yesterday. Truly enjoyed exchanging with the grazer community and discussing ways to better integrate our work with the Climate Beneficial Wool initiative. 11/09/2018: Welcome to Sequoia Williams, new Junior Specialist in the lab. Sequoia will be supporting our Almond projects and manage the lab. Glad to have you! 11/01/2018: I am glad to serve as an Associate Editor for Frontiers in Sustainable Food Systems with Claire Kremen as Chief Editor. My editorial services will be to the Sustainable Intensification and Ecosystem Services section. 10/26/2018: Spent a week in New Zealand with researchers from Ag Research, Rachael Garrett (BU) and Meredith Niles (UVM) learning about livestock reintegration into vineyards, which is the norm in New Zealand, and exploring modeling approaches to quantify benefits and tradeoffs. I came back full of ideas and motivated to work toward optimizing this practice for CA. It can be done! 10/11/2018: We successfully obtained a new CDFA SCBG to study sheep integration into vineyards and setup a replicated trial at Napa RCD demonstration Vineyards in collaboration with Kaos Sheep Outfit and Fibershed. Kelsey’s research is now funded! 09/24/2018: Quarter has started! glad to be teaching HRT200A to our new graduate student cohort. 09/11/2018: Congratulations to Vanessa for getting a “real job” at the Lawrence Livermore National Lab! Fortunately for us, she will still dedicate some time to her current project. These have been productive two years and I have truly enjoyed working with her. Wishing you the best of luck. 09/06/2018: Participated to writing the CalCAN recommendations to the incoming California Governor. Our cover crop project is featured p 35. I hope that California will continue to lead the way in adapting to climate change and scale up agroecological approaches. 09/05/2018:Welcome to our two new graduate students Krista Marshall (PhD) and Lindsay Dahlen (MsC)! 09/02/2018: Congrats to our team on publishing a timely review on shifts in N dynamics with climate change in Nature Sustainability! 07/28/2018: Met this week at Iowa State university with all my colleagues involved in managing long-term trials of corn cropping systems. Russell Ranch is so unique! We hope to be working toward developing more integrated data mining efforts to measure the impacts of diversification on ecosystem services, multi-functionality and sustainability outcomes of corn cropping systems. We will also aim to improve coordination of our research projects. 07/02/2018: Vanessa will be presenting a short talk + poster at ISME. She will share a novel approach to analyzing microbial co-occurence networks and how to tease apart habitat filtering effects when samples are combined. 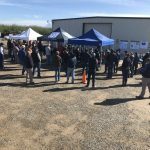 06/11/2018: One more successful field day at Russell Ranch this year. Meng and I presented our work on the impacts of management on root systems and their associated microbes and out investigations of water stress resilience in conventional vs organic tomato production systems. Thank you to all who attended! More here on the Plant Sc. blog. 06/05/2018: Appointed as Section Chief for Annals of Botany Plants (AoBP, Oxford press) to be re-launched in July under the expert chief edition of Tom Buckley here at UCD. I will be in charge of the Agroecology and Environment section. 06/01/2018: Talked to Tom Willey on the radio show Down On the Farm at KFCF (88.1FM Fresno) about crop roots in Agroecosystems . Podcast here along with some other very interesting conversations Tom has had with various scientists over the years. This was really fun! 05/20/2018: Congrats to Jen for getting her meta analysis of efficacy of bio fertilizers on maize yields published in FEMS microbiology letters. 05/09/2018: Welcome to our two new graduate students Krista Marshall (PhD) and Lindsay Dahlen (MsC), both in Hort&Agronomy. Kelsey, currently Junior Specialist in the lab, will also start his MsC this fall (Soil BioGeochemistry) building on his current research on sheep grazing in vineyard. More about their projects soon. Looking forward to the Fall! 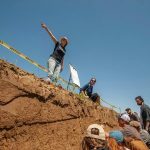 05/01/2018: We were awarded a CDFA Healthy soil demonstration grant to boost outreach and carbon sequestration measurements in our Almond cover crop project – Thanks Cynthia and Xia for your precious help in putting this together! 04/20/2018: Congratulations to Cynthia for obtaining a Western SARE Graduate Student Award and Annie Sustainable Agriculture Scholarship to support her cover crop in Almond project. Very well done. 04/05/2018: Ready for panel discussion today, talking about GHG mitigating potential of healthy soils at the Coalition for Agricultural Greenhouse Gases Meeting in Sacramento. Thanks for the invitation. Always a pleasure to team up with Kate Scow (UCD) and Karen Lowell (NRCS)! 03/10/2018: Kick start of PLS150! 16 sheep grazing half of our orchard grass/clover cover crop in our long term class experiment. Spring quarter will be fun. 02/22/2018: Gave seminar at UC Berkeley/USDA-ARS upon invitation from Devin Colemann Derr. Thank you, great discussions with researchers and grad students on rhizosphere ecology and plant-microbes interactions. 01/25/2018: Presented some insight on soil health in integrated crop livestock systems in California at the 9th Annual Agroforestry Symposium held at the University of Missouri. 01/09/2018: The lab joined the PABGAP program. This program seeks to provide University undergraduates from underrepresented minorities with experience that will prepare them for graduate study in plant agricultural biology. We will be hosting and mentoring Zakiyah Brannen-Buxton this summer. 01/02/2018: Ready for the new year. A big thank you to all the lab for their hard work! Also getting ready to teach ECL216 Ecology and Agriculture this quarter. 11/28/2017: Thanks to Mike Kolomiet for the invitation to present our work as part of the Texas A&M seminar series in the PLPM Department. Talked about our work toward developing integrated root ideotypes to build sustainability and resilience. Great input to move forward. 11/15/2017: Great interactions at the Soil Health Summit in Sacramento with growers, RCDs and members of the private industry. I discussed the services provided by healthier soils, from resilience to drought (Leah’s work) to insect pests (Jen and others in the casteel and Vannette lab). 09/22/2017: Welcome to Cynthia Creze, a new PhD student in the lab. Cynthia will be conducting both mechanistic studies and system-wide evaluations of the ecosystem benefits and tradeoffs of different cover crop mixtures in Almond production systems. Her work also includes a grower survey to better understand barrier to adoption and develop a coherent and relevant research agenda. Next step: integrate sheep to terminate the cover crop! 09/08/2017: Spent a lot of time talking to growers and farm advisors in California over the last two weeks. Came back with a sense that most production problems I heard off are linked to poor soil health. Looking forward to build up on this momentum to engage them in our cover crop and integrated crop livestock system research! 08/31/2017: Lot’s of achievements this quarter. First student to graduate from the lab: congrats Emily on a well-deserved MSc., first qualifying exams for PhD students as well! Congratulations to Josh as well who obtained an NSF fellowship to start his graduate studies at Cornell. Very proud of you all. 07/18/2017: New projects funded by the Almond Board of California to quantify ecosystem services provided by various cover crop mixtures in Almond orchards across a soil/rainfall gradient. Can we optimize mixes to enhance benefits and multifunctionality of almond orchards? This large collaborative effort will evaluate multiple aspects of more biodiverse floor management, from water conservation and shift in weed pressure to soil health, soil food web and pollinator services. 06/09/2017: Russell Ranch field day coming up! Will be talking about 1) integrated fertility and pest management and how healthier soil can help decrease plant attractiveness to leafhoppers and decrease the impact of the virus they vector. we will also be presenting a poster balancing benefits and tradeoffs of conversion to drip irrigation in organic systems. 06/08/2017: Part of the lab attended the SES annual meeting and soil health summit – inspiration and lot’s to chew on! 05/30/2017: New paper setting the stage of our research in integrated crop livestock system published. Congrats team. 04/06/2017: Welcome to Meng Li, our new postdoctoral fellow in the lab. Meng will be investigating linkages between rhizosphere mechanisms and productivity under optimal/stress conditions. Megan Machmuller, from CSU will also join us to perform key experiments on maize rhizosphere as affected by breeding. Welcome! 03/06/2017: Congrats to Joshua who made it into a PhD program at Cornell with an NSF fellowship! well deserved. 03/06/2017: New paper in Trends in Plant Science on root ideotypes for irrigated Ag. Congrats Jen! 05/13: University of California Berkeley, Diversified Farming Systems Roundtable. Thank you to the Berkeley Food Institute and Center for Diversified Farming Systems for the invitation. Event details and abstract here. 02/28: CalCAN Climate Summit: Ecological Benefits of Integrated Crop livestock Climate. Event details and abstract here. 02/24/2017: Welcome to Emad Jahanzad, our new postdoctoral fellow who will lead the lab research program on the importance of diversification and soil health to building sustainable and resilient Almond orchards. Emad will join in May. Welcome! 02/13/2017: Presented today a Policy Brief to the California Senate “Leveraging research to build climate smart agricultural systems in California”. Thanks to CalCAN for the opportunity, I truly enjoyed the exercise. 02/01/2017: Our continuing CTRI grant was approved to dig deeper into beneficial impacts of soil health management practices on insect suppressiveness in tomato and the underlying mechanisms (rhizosphere ecology –Vannette Lab– and defense compounds – Casteel Lab-). 01/21/2017: Welcome to Vanessa Brisson, our new postdoctoral fellow who will work with John Vogel and I on exploring the impacts of maize improvement on recruitment of beneficial microbes. Vanessa brings tremendous experience in bioinformatics to the lab! 11/09/2016: Our work with Scott Park and funded by OFRF aiming at developing integrated irrigation management strategies to improve water and nutrient use efficiency of organic processing tomato in California was featured in nice video! Check it out! 11/09/2016: Video of our project monitoring the long-term impact of drip irrigation on soil health and fertility management in organic tomato systems at Russell Ranch was presented at ASA this year. See 5-minute video here. 10/20/2016: The EcoFAB project is off the ground! Looking forward to collaborating with the LBNL to monitor the ecological outcome of potentially lost or gained plant-microbe interactions during domestication and breeding. 09/20/2016: New funding from the CDFA-Specialty crop block grant program and the Almond Board of California to investigate how adoption of cover crop and whole orchard recycling can help build resilience of Almond production to water shortage. Lot’s of exciting new projects! 08/10/2016: Congratulation to Leah for her Jastro fellowship to support her field research on the impact of crop diversity and tillage on drought resilience of corn-soybean systems. 08/01/2016: Welcome to Kelsey Brewer! Kelsey will be working on quantifying C sequestration potential of various cropping/rangeland/integrated systems in California and monitor the impact of carbon farming practices and other co-benefits provided by reintegration of livestock into cropland. Looking forward to working with Fibershed producers! 07/14/2016: Congratulations to Caitlin for a well deserved NSF-GRFP Grow scholarship to conduct her thesis work on characterizing field scale resilience of Integrated Crop Livestock Systems in Brazil in collaboration with Paulo Cesar de Faccio Carvalho at Universidade Federal do Rio Grande do Sul. 03/29/2016: Way to go Leah! Congrats on your NSF fellowship! 03/05/2016: First paper from the Lab in Frontiers in Plant Science. Congrats Jen! 02/15/2016: I became a shared faculty member of the JGI (Lawrence Berkeley National Lab), great new collaboration and projects in the work to better understand co-evolution of host and their rhizosphere microbiome as affected by selection and management. 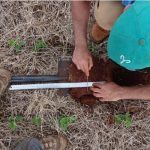 01/05/2016: We received seed funding from the CAES College to characterize shifts in rhizosphere processes with breeding and improve synergies between rhizosphere functioning and soil health building management practices. Congrats Jen! 12/04/2015: Thanks to the California Tomato Research Institute for supporting our research of how soil health building management strategies can help decrease tomato attractiveness to beet leafhoppers and the BCTV virus they vector: new generation of IPM! 10/26/2015: New grant from USDA-AFRI to investigate how manure amendments increase drought resilience via microbial communities in integrated dairy-forage cropping systems with Kate Scow and Jorge Rodriguez. Awesome! 09/24/2015: Congratulation to Joshua Garcia, an undergraduate student in the lab, for getting the McNair scholarship for 2015-2016. This fellowship will allow Joshua to develop an independent project on a novel rhizobacteria. Congrats! 08/21/2015: First grant awarded today by the Almond Board of California to study the potential of mycorrhizae and soil health to mitigate water stress in Almond crops. Exciting! 07/06/15: Lauching of a new collaboration with The International Potato Center as part of on-going efforts to develop integrated systems for the Humid Tropics. Our goal is to use ecological principles to sustainably intensify food production, improve food security and build natural capital of Kenya humid tropic agroecosystems. In particular, we will explore the potential of diversification with alternative food crops such as onion and potato to break disease cycle and decrease dependence on maize. 06/29/15: Congratulation to Caitlin and Emily for obtaining a JASTRO scholarship to support their field research, way to go! 05/27/15: Welcome to Emily Webster. Emily will be doing her MsC research in Columbia and Nicaragua in collaboration with CIAT and Steve Fonte. Emily will study how pasture management systems affects soil health, C sequestration and long-term productivity. More info here ! 04/05/15: Come join us at ASI Russel Ranch Sustainable Ag Field Day on May 21st. The lab will be presenting results on cover crops for integrated N management (more info Here). 04/03/15: Congratulations to Jennifer Schmidt and Leah Renwick on receiving Plant Science Graduate Student Research awards for 4 and 2 years respectively! Jennifer was also awarded a 1-year campus wide Graduate Scholars Fellowship. Good going! 03/24/15: Leah Renwick (MsC) will also be joining us in the Fall. In collaboration with the University of Guelph, Leah will study the potential of crop diversification and no till to mitigate the impact of drought on corn and soybean yields. 03/23/15: Jennifer Schmidt (PhD) will be joining the lab in the Fall. She will be looking at how maize domestication and breeding have shaped rhizosphere microbes and processes and the impact on crop ability to capture soil resources. 02/15/15: Will be speaking at the Agriculture and Climate Change Elsevier Conference in Amsterdam on “Agroecological approaches to help mitigate increasing limitation of corn yields by water availability”. 01/29/15: I am honored to now be a Fellow of the UCD Agricultural Sustainability Institute. ASI is a great hub that connects initatives in sustainable agriculture and food system and we are looking forward to engage and contribute to ASI research, education and outreach activities. I met with Jeff Mitchell and Conservation Agriculture Systems Innovation (CASI) farmer members last Friday to learn about conservation practices, ongoing efforts to improve crop production systems in the San Joaquin Valley and foster future collaborations. Thanks to Jeff Mitchell, Michael and Adam Crowell of Turlock, Darrell Cordova of Denair, and Scott Schmidt of Five Points for their time and dedication to conservation agriculture! 01/10/15: Welcome to Caity, the first member of the Gaudin’s lab. See here for more info about her research interests. 01/09/15: USDA undergraduate, pre and post doctoral fellowships available. Deadline: pre and post doctoral February 11, 2015, undergraduate February 18, 2015, with full applications due May 6, 2015. Contact me if you are interested in applying! 01/05/15: The lab officially kicked off!